An article and video was recently published on FOX 13 News on Tuesday, February 13th 2018. To read the full article, please click here. 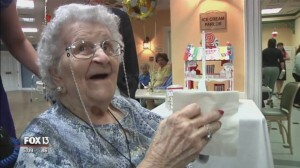 Virginia may have very well coined the phrase, “age is just a number.” She recently celebrated her 104th birthday but stays young at heart and plenty busy through dancing, and playing bingo with friends. Her secret to a long life? Live with a kind heart, enjoy dessert and hold your family close to you. “Don’t worry. Just take things as they are. Because they are going to be that way. Why worry? It doesn’t do a bit of good,” said Virginia. The Fountains at Lake Pointe Woods resident isn’t slowing down just yet, “I’m going to live another 104 years,” she said.